Based on successful Money Lessons for Life school programs, these innovative financial literacy tools make learning about money fun and easy to understand. They are a great way to teach kids, teens, and adults about money. You've never seen financial education presented like this before! You can help attack financial illiteracy right in your home or classroom by giving the gift that lasts a lifetime. 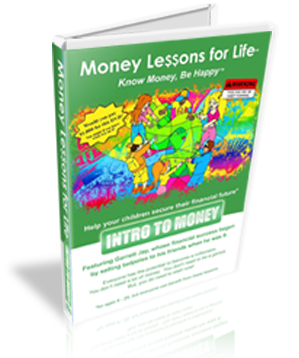 Learning just ONE valuable money lesson could be worth thousands of dollars in your future. We live in a complicated financial world, but this "Intro to Money" financial literacy DVD offers an easy to understand, yet powerful foundation for money education. These video lessons also explain why it's important to learn about money and how certain financial choices will affect your life now and in the future. Designed to be used with the Intro to Money DVD, this Teacher's Guide offers hours of activities to reinforce learning. Combo Deal! Buy both the Intro to Money DVD and Teacher's Guide and save $10! This offer is subject to change at any time, so don't delay...order today!